For hundreds if not thousands of years people have been creating brews, tinctures, salves balms and compresses to relieve skin ailments like acne. There must be some usefulness in these things, for our ancestors swore by their effectiveness. 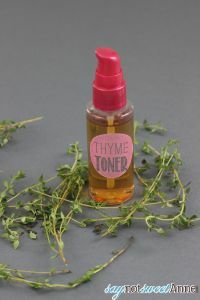 Interestingly, Leeds Metropolitan University presented a study with findings that show Thyme may be more affective at treating acne than prescription creams. Its no secret that I like to make my own beauty products. From the Clean and Healthy Moisturizer to my Mineral Foundation, I like to know what goes on my face. So, when I saw the study from Leeds, I knew exactly what product I was going to make! I’ve mentioned before that I spent years on a subscription plan to a fancy anti-acne system. I’ve also mentioned that my acne seemed to do better when I switched off that stuff and began cleansing with oatmeal and water alone. One element of the system that I did miss was a nightly toner. Now I’ve got one. And it is anti acne too! 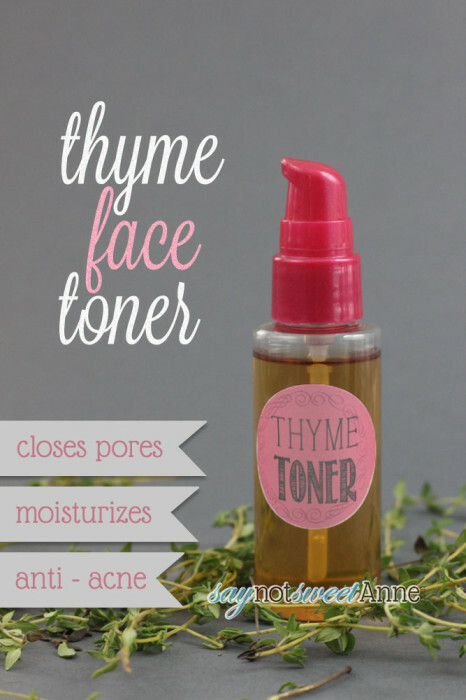 Fresh or dried Thyme (Thyme was noted in the study to be effective against certain bacteria responsible for acne.) Be sure it is organic and pesticide free. You do not want to put pesticides on your face regularly (or at all). Sterilize your steeping jar, and fill with witch hazel. The astringent nature of witch hazel helps to “tighten” skin and lessen the release of oils. The same principle means that it “locks in” moisture. Place your thyme into the witch hazel and let it steep for a day or two in a cool dry place. When finished it will be amber in color. Strain your liquid through the coffee filter and into the sterilized toner bottle. Done! I recommend making small batches and keeping them in the fridge. I use a pump style bottle so that I do not introduce bacteria to the mixture when I use it. Simply pump the toner onto a cotton ball and use it in trouble spots, or across your whole face! I’m definitely going to try this recipe! I could really use a product like this. thanks for sharing, going to try this. would you need to keep the batch that you are currently using in the fridge also? I would. The cold would be an additional soothing/pore closing element. I recently went camping for 2 weeks and kept it at room/day temp to no ill effects. There isn’t a poist, because there is really nothing to it. The basic premise is to wash without drying. Over drying can cause more oil production and make scin issues worse. Pluse there are a lot of good elements in oatmeal that sooth irritated skin. So basically I take a hand full of organic rolled oats (non bleached, as raw as you can get them) and pulse them a bit in my food processor until they are mealy. Then at night I put a bit into my hand, add a few drops of warm water, wait until the mixture feels slippery and then wash with it. I keep the jar of shredded oatmeal in the bathroom. Sometimes if I’m out of shredded, or lazy, I just use the oats as they come. It takes a bit more working with the fingers to get them slippery, but it still works. I also have an oatmeal and honey face mask here. I use grapefruit oil as an anti-acne agent, but keep in mind it adds to photosensetivity, and you should always use a sunscreen. You could also just leave that bit out. I’m definitely going to give this a try! My 2 older kids have entered their teen years, and could use this! Mine is steeping! Cant wait! Should i wash my face before or after applying the mixture? Its meant to tighten and close pores after washing. Enjoy!! 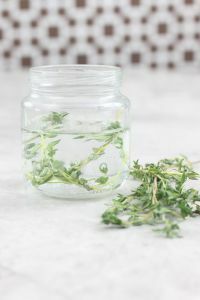 What is the measurements for witch hazel/dried Thyme? Thanks! I don’t have any measurements. The mixture is like tea. You can make it as strong or as weak as you want, depending on how much you steep in the witch hazel. Hope that helps! What type of witch hazel do you use. I am hesitant to use one with alcohol. I know there is a rose witch hazel out there, but not sure if this would be suffient with the thyme. Thank you. I don’t mind the type with alcohol, as many toners and astringents use alcohol with little ill effect. Of course, this is a toner, meant to be followed by a moisturizer. I’m trying to figure out what type of witch hazel to buy from Wal-Mart, which one do you recommend from there? Unfortunately, I don’t know what brands Wal-Mart carries for Witch Hazel, and I haven’t purchased that product there. That said, I’m sure any reputable brand would be fine for this project. There really isn’t a substitute for Witch Hazel in this recipe. However, there are plenty of Toner recipes out there that use other bases (Apple Cider Vinegar is a good one). For scarring, it depends on what you are dealing with. There are plenty of home remedies that can help with hyperpigmentation (dark spots left from acne) but not really any that will solve deep pitting. Hi there! Is there a time period for this recipe or is it pretty long lasting? Thanks! In my experience it is very long lasting. Results may vary depending on your sterilization and storing methods. Just don’t use anything that looks or smells funny. However Witch Hazel is general antibacterial, so growth in the recipe is unlikely. Can i use thyme essential oil? Hey Jess! I would definitely not recommend swapping essential oil. Oils are very concentrated, and it is difficult to say how they will affect something as sensitive as your face. Do you sell toners, moisturizers you make?